By Audrey Golden. Jul 13, 2017. 9:00 AM. Given that Kraków, Poland is a UNESCO City of Literature, it shouldn’t come as a surprise that Kraków is where the Nobel Prize-winning poet Czesław Miłosz (pronounced CHESS-wahf MEE-wosh) made his home until his death in 2004. Indeed, in addition to national presses, there are numerous independent book publishers located throughout Kraków, and there are nearly 80 bookstores throughout the city. Moreover, the city hosts international books fairs and literary festivals on an annual basis, including the Miłosz Festival, which honors the late poet and brings literary guests to the city every June. If you’re hoping to visit Miłosz’s home, you won’t find a museum space like those dedicated to many other writers in cities across the world. However, you can still stand outside the apartment building where the Nobel Prize winner lived, and you can experience the city of Kraków largely as Miłosz would have seen it in the final years of his life. In 1994, Miłosz moved back to Poland, settling into a relatively nondescript apartment building on Wojciecha Bogusławskiego, a small street just outside of the Stare Miasto, or Old Town, in Kraków. Years prior, the Nobel Prize winner emigrated from Poland, living briefly in Paris and ultimately settling in the United States in Berkeley, California. He moved to California to teach at the University of California, Berkeley, and he acquired U.S. citizenship in 1970. Given the common themes of Miłosz’s poetry, and the world of political uncertainty that he came to know intimately, it came as a surprise to some that he wanted to return to Poland. However, in 1994, he did just that. Are you interested in seeing the apartment building in Kraków where Miłosz spent the last decade of his life? The small sidestreet is a little bit hard to find. Once you walk outside the walls of the Old Town and can see Wawel Castle, you’ll need to locate Józefa Sarego or Świętego Sebastiana, both located off the relatively major thoroughfare Dietla—these are the two larger, parallel streets between which Wojciecha Bogusławskiego runs. You’re looking for the apartment building at 6 Bogusławskiego. Unfortunately, Miłosz’s home is not open for tours. If you do visit Kraków, you can stand outside the main entryway to the apartment building, and just by getting there, you’ll be walking in Miłosz’s footsteps. 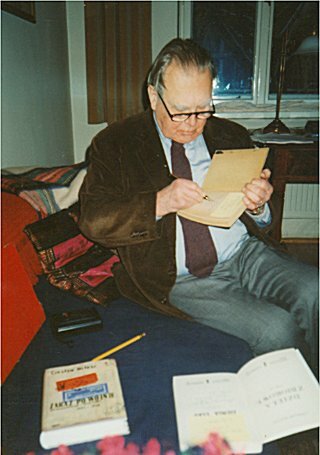 A short time ago, Miłosz’s friend Alexander Fiut, a Polish literature scholar, went inside the apartment—still looking just as the Nobel Prize winner left it—to take photographs of Miłosz’s belongings: shoes and slippers, his bookcases, and the stacks and boxes of books throughout the apartment. The poet’s desk, where he wrote, also remains within the apartment, underneath a window looking out into the courtyard. If you’re lucky, you might be able to convince a resident to let you into the courtyard to sneak a glance up to the window through which Miłosz, in some respect, saw the outside world. How can you be certain you’ve found the right apartment building? There’s a small plaque outside the entrance, identifying the structure as the residence of Czesław Miłosz from 1994-2004. If you’re traveling to Kraków, we urge you to seek out the small apartment building in your flânerie around the city. In the meantime, we invite you to pick up a collection of Miłosz’s poetry to get a sense of the writer’s aims and the timeless significance of his work.